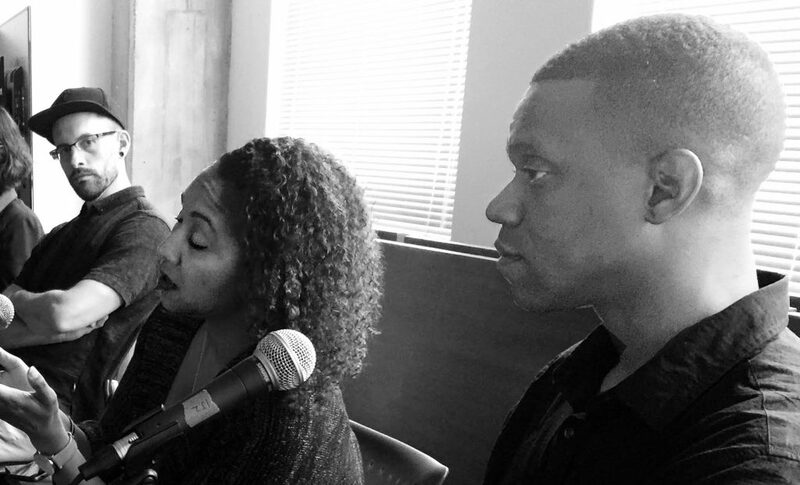 Oakland, Calif. — On Dec. 5 Impact Justice presented a panel of former prisoners addressing contradictions in prisoner support. California recently passed a number of prison reforms, including a felony murder rule, which originally mandated that judges sentence an accessory to a crime in which someone was killed as though they were the killer. In Fall of 2018 that law was amended so that a person’s charges reflect their role in the crime. However, people who received a life-without-parole (LWOP) sentence are not eligible for relief. LWOP prisoners first have to have their LWOP sentence vacated through a habeas petition. Impact Justice panelists, from left; Shane Bauer, Terah Lawyer, and Emile DeWeaver. Photo: Urszula Wislanka for News & Letters. Another contradiction that stunned the prison movement is the way the hard fought for reform of the bail system (see “Women demand: ‘End money bail!,’” July-Aug. 2018 N&L) got distorted. The final bill, signed by the governor, did abolish money bail, but created instead a “risk score” algorithm to determine if a person is a “public safety threat.” Such algorithms reinforce existing racist rules, potentially making it easier for prosecutors and judges to keep people in jail, meaning many will not get out even if they could have raised bail. Shane Bauer, a journalist held in solitary confinement in Iran for two years and reporting on U.S. prisons since his release, spoke about his stint as a guard in Winn Correctional Center in Winnfield, Louisiana. He witnessed many injustices and noted that he could not be just an observer; he had to participate in the institution everyone there hated, prisoners and guards. Emile DeWeaver, founder of Prison Renaissance, a community of incarcerated artists said: “We live in a system that is not designed to change. We face the question of how do we work on conditions in an ethical way. [Because of] the recently passed reform of the felony murder rule, a lot of people are going to be free and that’s beautiful. But we are again excluding a class of people. In setting up the next victory, we become too short-sighted. We just want another victory. “Take bail reform. Yes, we need to reform the bail system. But we got side-tracked, chasing bail bondsmen, who profit from mass incarceration, and we forgot to actually solve the problem! The problem was we hold people pre-trial! The fact that some are making millions from it is just the blood that’s flowing from the wound that we still didn’t close. This is not happening because we don’t care. This is happening because we’ve only had one model of power in our life. “We have to start acknowledging that we don’t yet have the imagination to solve our problems. Our step one: we have to start building the imagination. …We have to stop waiting for the state or the institution to solve the problem it is not designed to solve. We can solve it. We can organize. We can engage the community, engage incarcerated people. The system relies on a powerless population. So empower the population! “When we improve people’s lives, we actually connect with them. Important as it is to take prisons out of this world, it is not just an act of taking them out. Investing in incarcerated people is putting ‘in,’ investing in their power. “Take the right to vote. Invest in incarcerated people’s political power.… Give incarcerated people economic power, the right to work for whoever they want to work for. “If you have a right to vote, a right to organize, a right to work, or not work, you have the same strategies that people in the Civil Rights Movement had available to them to at least begin some steps to change the way our country operates. “The system functions because it’s not transparent. So work to restore media access to incarcerated people. It is now a human right to have internet access. If incarcerated people had internet access, it would provide more transparency. “We can’t dismantle the prison system without incarcerated people. We have to start addressing things that are in the way of incarcerated people doing that. This entry was posted in Articles and tagged bail reform, Central California Women’s Facility, Emile DeWeaver, felony murder rule, Impact Justice, Life Without a Possibility of Parole (LWOP), money bail, parole, prison guards, Prison Renaissance, prisoners, Proposition 57, risk score, Shane Bauer, Terah Lawyer, Urszula Wislanka, Winn Correctional Center. Bookmark the permalink. Confronting reforms that are part of institutional thinking, reforms which often have opposite unintended consequences, Emile DeWeaver appeals to us to recognize our lack of imagination. Marxist-Humanists’ experience in the prison movement that unfolded out of the Pelican Bay hunger strikes where we were active from the start was that a new direction emerged not only by opposing something external, what DeWeaver calls taking prisons out of this world, but rather by prisoners empowering themselves. Marxist-Humanists call this not being defined by what one is against. In general, the positive in the negating what is demands starting from and and also returning to humans’ constant struggle to be free in their lived experience. Pelican Bay prisoners on their own established new relations in distinction from the prevailing gang culture, a culture fomented by the guards. The prison officials made it impossible for anyone to get out of solitary without snitching, turning someone in whether true or not and in doing so endangering one’s life. (See “Prisoners endangered” for an account of the ongoing divide between prisoners and guards on dealing with “snitches.”) Gang validation was a completely arbitrary prerogative of the prison officials. Our Marxist-Humanist correspondent Faruq got 6 more years just for having a copy of the Bay View paper which carried an article on Black August. The hunger strikes inspired tremendous support first from other prisoners and then from family members, the prison and human rights movements nationally and even internationally. On the cusp of the victory, which prisoners knew was coming down, Pelican Bay prison initiated so-called “wellness” checks. “Wellness” checks are one of those ill-thought-out reforms DeWeaver speaks of. They were instigated by liberal lawyers from the outside. The total contrast–between prisoners seeing the power of their own ideas put into practice and outsiders promoting their own solutions–became very graphic when Urszula Wislanka and myself interviewed about 20 prisoners just when these two realities came into play at the same time. The prisoners knew a victory was at hand that would end indefinite solitary confinement and, at the same time, told us the the guards turned the “wellness” checks into a torture of no one getting any sleep. They tried, unsuccessfully, to break the prisoner’s movement, their solidarity. Ever since the “wellness” checks have been shown to be a complete fraud. The guards just show up to prove they are there, but prisoners have committed suicide, found many hours later after many “wellness” checks. The lawyers pushing the reform persist, instead of looking to the prisoners for how to change the conditions that push some to suicide. Marxist-Humanists hone in on the idea that came from within the hunger strike movement, namely, being “validated as human” as a universal that has to be recreated ever anew. The universal is never identical with what is called external reality but nevertheless constantly goes beyond the ways any particular external reality impedes such validation. The practice of philosophy helps the universal of freely determining one’s life activity stand on its own, making it clear that not being defined by what one is against, doesn’t stop with any one particular victory. This idea has shaped both our openness to new movements as well as projection of a different future. Humanity has seen so many revolutions and movements get transformed into their opposite, when even after victory over an old regime, reality again gets fixed, the spontaneity of the ideas gets lost and ideas get imposed externally from outside the movement. It is time to imagine and help birth a new kind of revolution in which participants experience the world as the self-movement of the freedom idea that comes from within.